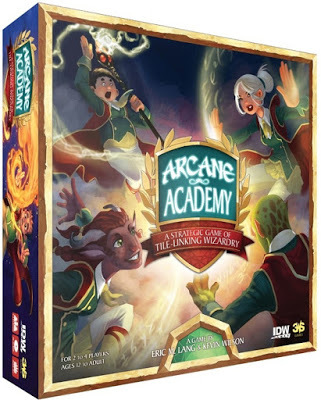 Arcane Academy is a tile-linking game where 2-4 players play as young spell casters vying to become the best in their class. Forge magical items and harness elemental energies to position yourself above your rivals. The game is aimed at ages 12+, and is marketed as being easy to learn and fairly quick to play, around 45 minutes. MSRP will be $39.99. I’m interested in seeing how young this game will actually play, being a marketed as a family game. Sometimes the ages slapped on the box are way off the mark. From what I’m hearing about game play, it doesn’t seem like it would be too bad for a younger audience.